It's hard to think of a road comedy that equals or beats Martin Brest's Midnight Run (1988), his less successful but more entertaining follow-up to 1984's massively popular Beverly Hills Cop. Written by George Gallo with pitch-perfect lead performances by Robert De Niro and Charles Grodin (and a deeply talented roster of supporting actors), it's an effortlessly enjoyable romp that's aged incredibly well during the last 28 years. 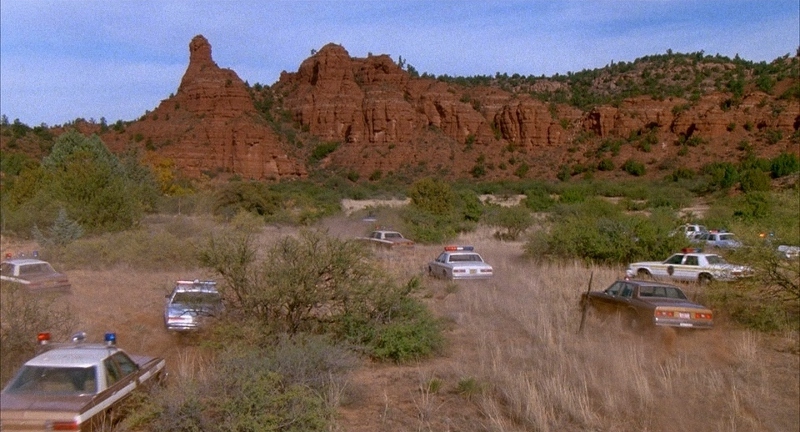 Featuring a fantastic script, loads of laughs, no shortage of quotable lines, a few twists and turns, and an obvious respect for its characters and audience, Midnight Run serves up a first-rate adventure that's just as enjoyable after a dozen or more viewings. The story goes like this: ex-cop and reluctant bounty hunter Jack Walsh (De Niro), currently working with sleazy bail bondsman Eddie Moscone (Joe Pantoliano, naturally), has just been offered the deal of his career: capture Jonathan "The Duke" Mardukas (Grodin), an accountant who embezzled and gave away $15 million from Chicago mob boss Jimmy Serrano (the late, great Dennis Farina), and haul him back to L.A. for an easy $100,000. He's got five days to do it...and even with the FBI (led by agent Alonzo Mosely, played by Yaphet Kotto) on Mardukas' trail---not to mention Serrano's henchman, who are willing to pay Walsh a lot more---he tracks down and handcuffs "The Duke" in less than half the time. 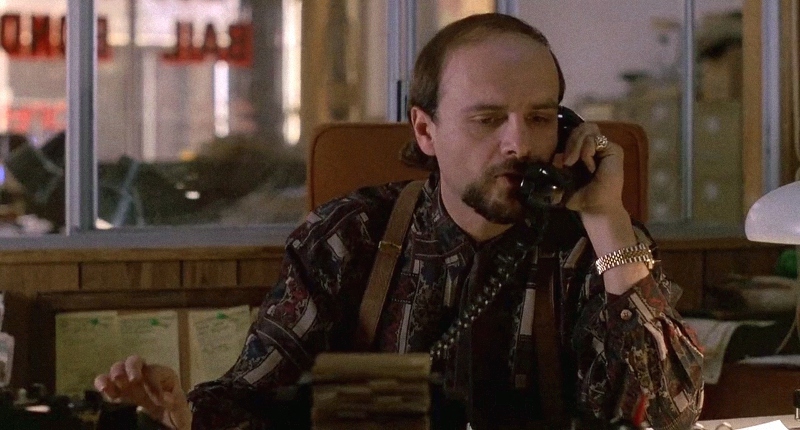 But it's the return trip that proves to be Walsh's biggest challenge: aside from the FBI and Serrano's men, he's also got to deal with rival bounty hunter Marvin Dorfler (John Ashton) and, of course, the stoic and smart-mouthed Mardukas, who attempts to outsmart and morally debate his captor at every turn. Their prickly verbal sparring is just one of the many reasons why Midnight Run succeeds where other comedies fail, or at least flounder. It's got a wonderful sense of self-awareness and respect for its characters that naturally extends to the audience, as almost no one on-screen regularly goes for the easy jokes. In the wrong hands, a character like Walsh (or any of his rivals, honestly) might be played for dumb laughs or slapstick. And while Midnight Run dabbles in physical comedy at times---not the least of which is a hilariously high number of one-punch knockouts---it consistently stays on the right track by throwing in a dash of well-earned drama, a couple of clever running gags, and most importantly, more than one perspective. We never see Mardukas' crime in real-time or flashback, but the fallout is explored in enough detail for us to understand (and in many cases, empathize with) every player in the game. From top to bottom, the cast and crew of Midnight Run turns in some of the best work of their careers. George Gallo's airtight screenplay provides a sturdy foundation, though he and director Martin Brest---a hugely underrated talent who all but disappeared since Gigli 13 years ago---weren't afraid to let the cast improvise. De Niro and Grodin deserve all the credit in the world for their fantastic chemistry and comedic senses, ranging from subtle expressions to pitch-perfect line delivery...and in the wake of Little Fockers and My Summer Story, performances like this look even better. 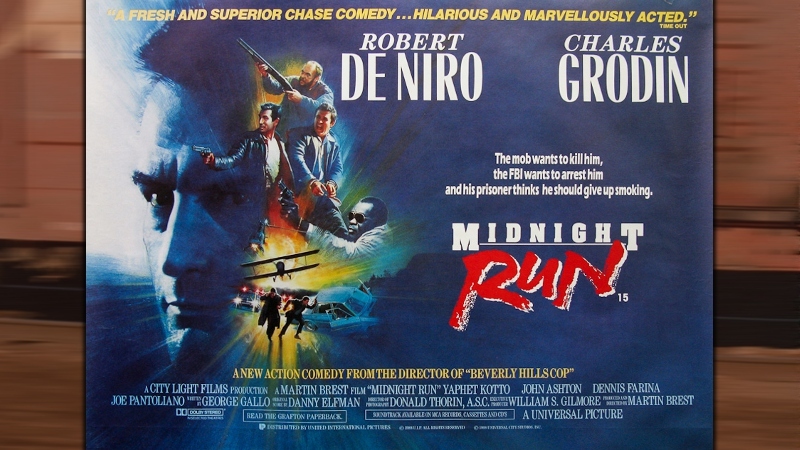 On the other hand, De Niro's then-reputation as an exclusively "serious actor" made ventures like Midnight Run a gamble; until that point, his biggest departure was 1982's uniquely subversive The King of Comedy. I'd also regret not mentioning Danny Elfman's score: far removed from his more well-known work with Tim Burton, his jazzy and upbeat contributions complement many scenes perfectly without calling attention to themselves. 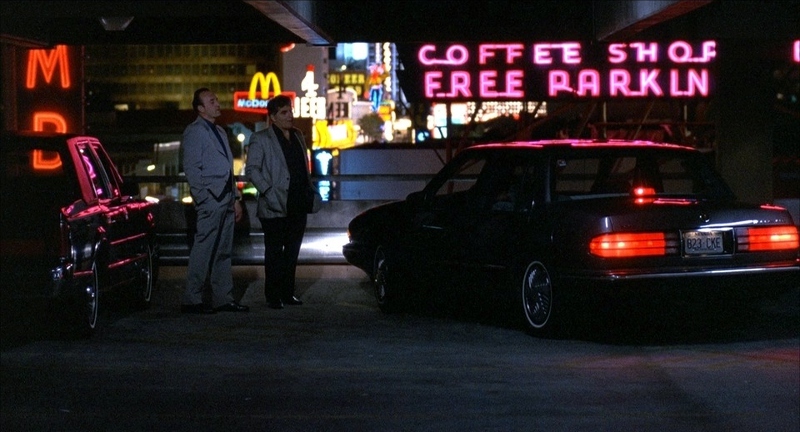 As a whole, Midnight Run works even better than the sum of its parts: it's simply a great time at the movies, flows extremely well from start to finish, never overstays its welcome despite cracking the two-hour mark, and has aged just about perfectly during the past three decades. Shot in several states (and even New Zealand at one point, due to weather conditions), if offers plenty of memorable visuals and locations even though most of its finest moments are surrounded by four walls. More than anything else, it's the kind of movie that's enjoyable long after you've memorized all the key dialogue exchanges, or one that you immediately stop and watch when channel-surfing on a lazy weekend afternoon. Enjoy Midnight Run for what it gets exactly right, and breathe a sigh of relief that studio executives gave the director final casting privileges and we ended up with Charles Grodin instead of Cher. Originally released on DVD back in 2003 and on HD DVD four years later (let's just ignore the three made-for-TV sequels, shall we? ), Midnight Run was long overdue for a Blu-ray upgrade but we've finally gotten one. Shout Factory has once again come to the rescue, naming the film as the third entry in its new "Shout Select" line along with Buckaroo Banzai and John Carpenter's Elvis. It's a great package overall, the highlights being a solid new A/V presentation and a handful of extras partly sourced from two Region B Blu-rays released internationally last year. Presented in its original 1.85:1 aspect ratio, this new 1080p transfer of Midnight Run (sourced from a new 2K scan of the interpositive) looks even better than expected, especially in comparison to Universal's DVD and HD DVD releases from forever ago (separate Region B Blu-rays were also released by Koch Media and Second Sight in the last year or two, but they were reportedly nothing special). In any case, this is an excellent transfer that's loaded with detail and looks extremely natural at times, especially during the many and varied outdoor scenes. Textures, depth, and film grain are solid, with only a handful of dimly-lit or nighttime sequences showcasing anything less than good-to-great quality (and even then, it's never a distraction). Overall, this is the best that Midnight Run has ever looked on home video, and I'd imagine that die-hard fans will be pleased with the results of this long-overdue upgrade. Both audio options (an English 5.1 DTS-HD Master Audio remix and the original 2.0 DTS-HD Master Audio Surround track) sound much better than anything we got on the DVD and HD DVD releases. Dialogue and overall depth are typically strong with a surprising amount of punch for Danny Elfman's score, as well as the handful of car chases and shootouts. Directionality and rear channel effects are generally limited---in fact, during many spots the 5.1 and 2.0 tracks are virtually identical---but they are appreciated on several occasions along the way. There's even a solid amount of low end at times; it almost borders on overcooked, but perhaps that's just because I was so familiar with the relatively flat-sounding DVD mix. Optional English subtitles have been included during the main feature only. Shout's menu interface is easy to navigate, but its background and overall layout makes Midnight Run look more like a cheesy family movie. Separate options are provided for chapter selection, audio/subtitle setup, and bonus features. This one-disc release is housed in a standard keepcase with attractive reversible cover designs featuring new and vintage poster artwork, but the lack of a slipcover will probably drive OCD "Shout Select" collectors up a wall. New to this release (kind of) are six Cast and Crew Interviews. The first---and only exclusive---features Robert De Niro (7 minutes), which actually turns out to be a much shorter 1-2 minute chat that's spliced in with clips from the film and a narrated summary. This is extremely disappointing given its prominence on the packaging, but at least there's better to come. The sort-of-new other interviews were produced by Severin Films in 2015 and first appeared on Koch Media and Second Sight's Region B Blu-rays from the same year, and they include separate sit-downs with Charles Grodin (12 minutes), Joe Pantoliano (14 minutes), John Ashton (17 minutes), screenwriter George Gallo (25 minutes), and an audio interview with Yaphet Kotto (8 minutes). Unlike the De Niro chat, these are much more focused, candid, and entertaining, so anyone who hasn't seen them already will enjoy every minute. Carried over from Universal's 2003 DVD are two nuggets: a vintage EPK-style Featurette (7 minutes) and the film's Theatrical Trailer (2 minutes). Unfortunately, the latter is still presented in rough-looking 1.33:1 format. Missing in action is...nothing from any previous domestic discs (not that there was much). A poster gallery and teaser trailer were included on those Region B Blu-rays mentioned earlier, but they haven't been ported over. 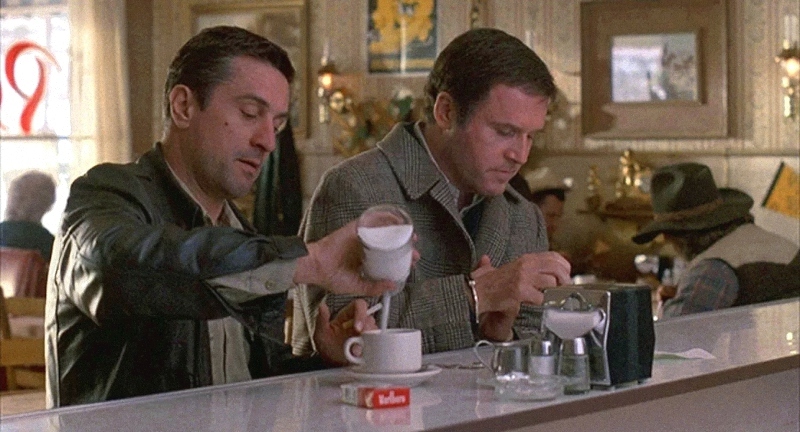 Martin Brest's Midnight Run is still an absolute blast from start to finish, and that's not something you can say about a lot of comedies approaching the 30 year-mark. This is an effortlessly entertaining, endlessly watchable adventure with top-notch performances, solid direction, smart characters, a fantastic script, great music by Danny Elfman, and more than its fair share of quotable lines and memorable moments. If for whatever reason you've never seen this one or haven't watched it in years (decades? ), you'll find that it holds up incredibly well and reminds us that a Robert De Niro comedy didn't always spell disaster. Shout Factory's long-awaited Collector's Edition is a solid effort, sporting a terrific new A/V presentation plus several great (and a few not-so-great) bonus features. It's a fairly well-rounded package that fans of this underrated gem will enjoy, hands down. Highly Recommended.